Xtractor™ is a user-friendly RFID component that helps you to integrate your RFID hardware with just a few clicks. It is easy to install and use. With Xtractor™, you can develop your own RFID system with a few steps only. If you have an existing system, Xtractor™ can help you to integrate the new or existing system with simple procedures. 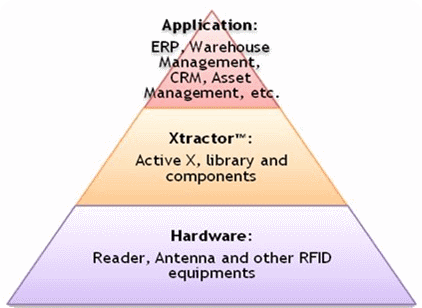 Xtractor™ is the ultimate RFID component for shorter RFID solution implementation time. Xtractor™ is .Net component/library for RFID programming; it supports Visual Studio 2003, 2005, 2008 and other programming language that supports ActiveX. Functions to read, write, list tag, etc.